Fans have seemingly had enough of Siraj and his antics on the field and have clamored for his removal on social media. The Royal Challengers Bangalore fans saw one of the worst performances from their franchise’s bowlers against Kolkata Knight Riders at the M Chinnaswamy Stadium as the home team lost a match that they should have won. The batsmen of RCB team did their work perfectly and put on 205 runs on the board with AB de Villiers and Virat Kohli scoring half-centuries each. 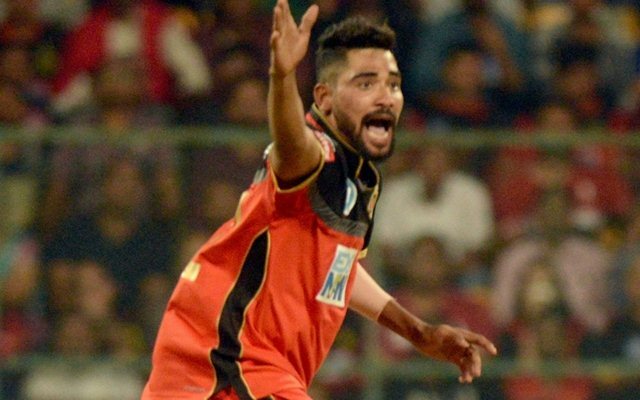 However, all the hard work done by the batsmen were nullified by the RCB fielders and bowlers, and one of the biggest culprits was Mohammed Siraj. Siraj dropped a couple of catches on the field and then enraged a sleeping beast in Andre Russell with a beamer. Russell was struggling with one run in first four balls, hit the shoulder high full-toss for a six and then steamrolled the RCB bowlers playing one of the most brutalist innings in T20 history. Mohammed Siraj went for 36 runs in his 2.2 overs and was roasted by fans on social media. Siraj has been expensive in the death overs for RCB but continues to get chances in the playing XI. Siraj got Russell going with that full-toss and he then scored 48* in 13 balls with 7 sixes to hand RCB a defeat that was hard to swallow, given that RCB needed 53 runs in last 18 balls to win the match. Siraj had dropped two catches as well, the first one was Chris Lynn in the 11th over off the bowling of Marcus Stoinis and Lynn went onto score 43 runs. The second chance was of Nitish Rana, who Siraj dropped off the bowling of Chahal and he scored 37, despite getting out the next ball. Fans have seemingly had enough of Siraj and his antics on the field and have clamored for his removal on social media. Here are some of the best tweets. No need for 3rd seamer..
Washington sunder in place of Siraj will do..
@imVkohli Mohammed Siraj, no value addition in RCB, dropped a crucial Lynn! Kohli please drop this guy to increase the winning %.